Convert units of temperature between Celsius, Fahrenheit, kelvin and many other historical temperature scales, with Alcula’s handy temperature conversion tool. Alcula now features a simple statistics calculator for calculating averages (mean, median and mode) and measures of dispersion (standard deviation, ranges etc.) from a set of numerical values that you provide. You can paste your data from a spreadsheet or a text file or enter the individual values manually. Quadratic equations are very easy to solve using a calculator. Alcula’s scientific calculator makes it even easier. This is the first of a series of examples of how entering commonly used formulas as user defined functions into the scientific calculator can help you streamline your work, weather your are checking your homework or verifying the solutions to the exercises in your math textbook. Following the nice comments received about the new calculator’s functionality, and since no new bugs were reported, I had time to work a bit on the scientific calculator’s look. The new version adds two user selectable color themes: ‘Wooden’ and ‘Smoke’, the original theme is now called ‘Classic’. The online scientific calculator now supports complex numbers operations. Complex numbers can be input in Cartesian, Polar, or Exponential form. You can also use the calculator to convert to and from cartesian, polar or exponential. Read on to find out more. The latest release of the online scientific calculator includes a new functionality: The preferences window. 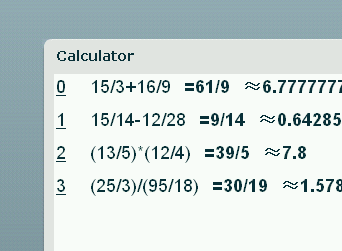 Here you can set the display format for the calculator results. This article gives a bit more information on how the calculator stores numbers internally, it’s precision limitations and explains how to use this new feature. As seen in a previous post, the new online scientific calculator now has a random generator function. This article describes the new function in detail and how to use it for generating random integers within a specified interval or for simulating random events such as the rolling of a dice. The LCM and ROUND functions have been added to Alcula’s Online Scientific Calculator’s release 0.7. This article describes what they are and how to use them. 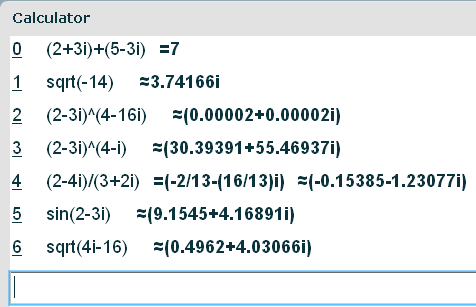 One of the most unique and useful features of the online scientific calculator is it’s ability to perform calculations on fractions without converting them to floating point numbers. This article describes how to use it’s power to add, subtract, multiply, divide and even raise fractions to a power. 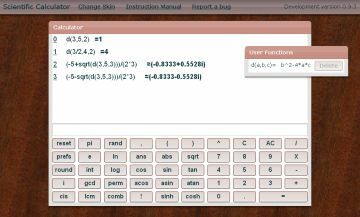 With the latest release (0.6) of the Online Scientific Calculator, come two new functions: INT (Integer) and GCD (Greatest Common Divisor). Here is a brief explanation of how they work and why they are useful.